Have you found an online vendor selling Facundo Paraiso? It's smooth enough, but still a little heat. It's a good rum, but it's forgettable. My bottle will be brought out when I want to make someone feel special who doesn't know all that much about rum. At this price point, I can't really recommend it, but I don't want to trash it either. Out of all the rums i have purchased, this is the smoothest by far. On the nose it is light and not overpowering. Dry fruits, hint of vanilla. On the tongue it is very Balanced, no burn whatso ever, the least i would expect. Bottle 330/2000. Great looking bottle, my biggest disappointment would be the finish which is my favorite part of rum tasting and that is the finish dies off very shortly after the swallow with very little linger which to be honest is a bit disappointing. Is it worth the money..... Nah if I had it to do again I would have to pass. This was a Christmas gift from my wife (do I have a great wife or what?!?) I was super excited to try this, as I really enjoyed the Facundo Exquisito, this is my 100th RumRatings review, and I am the first reviewer of this! This didn't let me down. Bottle 820 of 2000. Has notes of caramel, sherry, sugar cookie, marzipan, oak, and a wonderful spice. This is absolutely smooth as silk. Hints of sweetness, but not too sweet. I generally like sweeter rums such as the Diplomatico 2000 (which I slightly prefer to this). But this is a fabulous rum. Right at the top of the '9' scale! It is very mellow and pleasant on tongue, it has subdued dark caramel taste. The best Facundo/Bacardi on sale, shame it comes with a price to match. This is a great rum with notes of chocolate, caramel, barrel spices, and melon. This is drier than the other 2 Facundos. Extremly full a complex rum. Solera blend where youngest rum si 23yo. Aroma with little spicyness and hints of malt whiskey smoke. Taste is sweet with tones of caramel and honey, but also with with earthen tones od oak, smoke, vanilla. Aftertaste begins with wood and and bit fruity, blackberries maybe. You can feel influences of different types of cask that were used for aging. Really exceptional rum, but still not worth the money. A smooth silkyness on the tongue coupled with a warm burn and a hint of sweetness. Burnt amber color with flavors of raisin, caramel and slight smoky leaves. Bottle 65/2000. This was purchased for me by my wife to celebrate our 35th anniversary, so I had to dedicate a special time to open. We had our family over and thought it was a great opportunity to share. I was once a Bacardi snob and thought nothing could be better than PR rum, but then once I tried other brands I realized PR didn't have anything on Barbados and the other islands. Surprisingly this rum is a product of Barbados! It is silky smooth and very enjoyable. Delightful nose, not too sweet, slight fruitiness (cherries?) and very smooth finish. Is is worth $300? Probably not. Due to price I am going to savor every drop of this beautiful bottle and keep it in its display box. Facundo Paraiso XA comes in a gorgeous bottle, worth 10 points. Paraiso to the nose has a surprisingly strong alcohol smell to it, but the taste test is very smooth with hardly any afterburn. 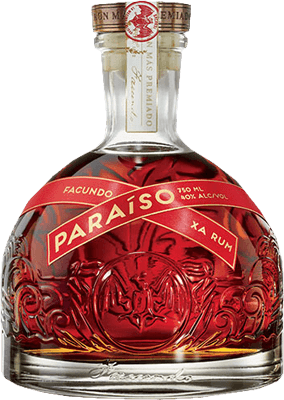 Paraiso XA is easily the smoothest Facundo line rum, but way overpriced in my opinion to earn anything greater than 8. Exceptional. Warm, silky feel and vanilla, almond and spice notes.